It's 20 minutes until 2009. The 9 year old has a friend sleeping over. (Her parents are attending a New Year's Party, so it seemed simpler for us to invite her to stay here. Now we have to go organize their noisemakers to celebrate the new year. which I now can't use because they have expired. to gather all those things that need to go to the cleaners. to plant the bulbs that I bought with such hopes. to caulk the leaky windows to keep the house warm. is that I completed my last packet for Vermont College. And because Christmas is over and all the presents were wrapped and given out or sent. Time is a wonderful thing to have. Merrie Christmas and any other holiday you celebrate during and after the winter solstice. You do celebrate Festivus, don't you? It's time to go visit MotherReader's Festivus Annual Airing of the Grievances. and air your gripes to clear the air to make room in your heart for happiness -- so you can enjoy the rest of the week's holiday celebrations. This year the 9-year-old took over the decorating of the Christmas tree. And decorated it. And decorated it. It's never had so many ornaments. This year she chose to use the silver garland and ornaments, but while I was making dinner, she got out the box of Angel stuff too. Yikes! Now the tree is full as full can be and there's overflow angels all over the living room. Now, who's going to help me UNdecorate come January? If you are in the neighborhood of the Bel Air Library (Maryland) on Saturday afternoon, I'll be signing books at the library store. It's located at the entrance of the building and is full of great last-minute Holiday gifts. If not signing, then I'll do a storytime for any passing children. If not doing a storytime because most sensible people will be at the mall doing last minute Christmas shopping before the snowstorm hits Saturday night, then I'll be sitting there reading a book or playing with the Folkmanis puppets they sell at the library store. I've been so immersed in completing everything for this semester at Vermont College that, when I printed out the last item (due to be in the college office on Friday) and lifted my head from the computer, I was shocked to discover that next week is Christmas. Yikes! Is our house decorated, yet? You've got to be kidding. Nope. Nadda. The nine-year old will be a "WHO" in the 'Grinch that Stole Christmas' at her day care. TODAY! (It's a huge place and they do large productions for holidays.) So this morning we had to get her dressed into a suitable 'who' skirt and striped tights. Pink stripes below and green top above -- sounds suitably Christmas to me. And then her hair. Have you SEEN the who hairstyles? Hairspray was necessary and I'm still not sure it will be together by showtime at 5:30. We shall see. A redheaded boy will play the part of the Grinch. This should be in-ter-est-ing. I hope you are more 'ready for the holidays' than I am. 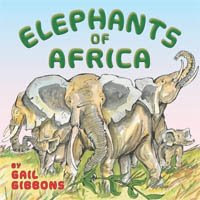 Elephants of Africa by Gail Gibbons. New York: Holiday House, 2008. Available now. 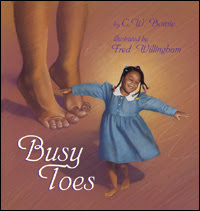 Gail Gibbons has been doing illustrated nonfiction books for years. Gradually the size of them has grown larger. I'm hoping the publisher sticks with this size, because any larger and they will no longer fit on library shelves. Her double page spreads show the elephants in action, in the wild -- eating, moving in herds, care of the young. She even shows a cut-a-way of the very thick skin with an explanation of why it is necessary. Since these are African elephants, she also extols the practicality of having very large ears. More blurbs of information are on the last page. For elephant fans of all ages. 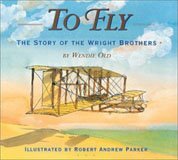 More Nonfiction Monday messages are here. Today the Woman's Club of Joppatowne held their annual Brunch with Santa in our library. Children ages 3 to second grade must either have read 6 books or have 6 books read to them to qualify for a free ticket to this brunch. The library handles all the advertisement and the exchange of reading logs for tickets. 1) Santa books and songs -- especially Douglas Wood's What Santa Can't Do. 2) The Night Before Christmas program -- with a special appearance of Maynard Moose's little sister moose, who tells Willy Claflin's famous story, The Night Before Chrissmoose. 3) The 12 Days of Christmas program -- the kids help me sing the song and I use various books, crazy or serious, that feature the song. At each of these three programs, I show off some of my Robert Sabuda cut paper Christmas books, many of which are available for check out at our library. After donuts and juice, Santa arrived to talk to each child, have a photo opp, and hand out presents. As the relatives took pictures of the children (mostly with their cell phones), one mother wondered why all Santas told the kids that, Oh yes they'd get the gifts they asked him about. In between the two programs, our volunteer Santa heard about this. He decided to try to rephrase his responses at the Noon event -- and he did. There will be birthdays in the next twelve months; books keep well; they're easy to wrap: buy those books now. Buy replacements for any books looking raggedy on your shelves. 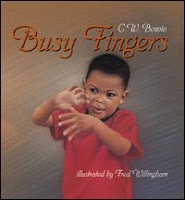 Stockpile children's books as gifts for friends who look like they may eventually give birth. Hold off on the flat-screen TV and the GPS (they'll be cheaper after Christmas) and buy many, many books. The grateful booksellers will be hanging onto your legs begging you to stay and live with their cat in the stockroom. 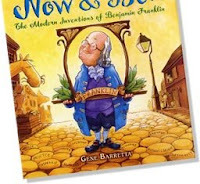 Now and Ben, the Modern Inventions of Benjamin Franklin by Gene Barretta. Henry Holt and Company, 2008. Available now. 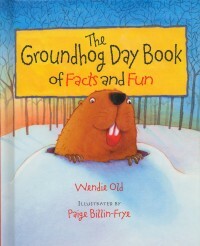 What a neat picture book/ science book/ invention book/ etc. As you move through this book -- on your left is today. And items we use today. And over here on the right is Ben, using the invention that he created that is either still being used today, or else was the origin of something we use. A-Maz-Ing! The author, Gene Barretta, is an illustrator who has worked many years in film and TV production. He lives near Philadelphia and even named his son, BEN ! More Nonfiction Monday posts can be found here. It's the week before Vermont College Packets are due, so it's a busy one for me. Plus, since this is the final packet, there are all sorts of end-of-semester reports to do as well. It's an exciting time -- the last Packet. But it's also depressing -- it's the very LAST Packet. From here on out, my short stint at college will be winding down and by the end of January it'll be over. It was fascinating, stressful, wonderful, and awful -- all at the same time. And I'm going to miss it very much. With any luck, I'll be able to keep in touch with some of the writers in the program. They also suggest that I give myself strict deadlines and continue to put the pressure to write on myself to keep producing. Good advice for all writers.